At the beginning of every new year most people (women more so) make a resolution to lose weight, eat sensibly and all the promises that go into making that resolution. I too have consistently made that resolution, gone gungho into the whole new diet exercise regime and have not lasted till February. Many articles in magazines, on the internet all claim that if you give up certain foods or drinks, you’ll automatically lose weight or if your drink hot lemon water, have lots of chia seeds, add cinnamon or black pepper to your water etc etc. There are so many different kinds of diet tips. There are so many different types of diets out there… South Beach Diet, Vegan diet, Keto diet, Paleo diet,Atkin diet, Mediterranean diet, Raw food diet, Zone diet, Intermittent fasting diet, etc. Some of these diets work for some and it doesn’t work for others. However the most sensible tip is to eat in moderation and exercise (not that I follow that). If I did follow the mantra then I wouldn’t be overweight. Maintaining an ideal weight and overall good health is all about changing your lifestyle and making good choices. As hubby and I age, we constantly endeavor to make small changes in our daily diet and choices we make. I may not attain the weight I was when I got married 36 years ago, but now our main aim is to be healthy and able to our personal chores by ourselves. I sometimes replace white rice with brown or black rice or millets. I try to avoid sugar as much as possible and use natural sweeteners like honey, dates, maple syrup. We don’t drink juices from packets or bottles. Making good choices doesn’t stop. That doesn’t mean that we do not enjoy the occasional ice cream, dessert, caramel popcorns, pizza etc. Are you wondering why I’m talking about diet and good choices today? FoodieMonday/Bloghop’s 180th theme is low calorie food a theme suggested by Sujata Roy who blogs at Batter Up With Sujata. Check out her blog some diabetic friendly recipes. All millets are healthy and a good substitute for rice. I’ll not go into all the benefits of including millets in your diet as there is enough information on the internet about it. I find that having millet is much lighter on the tummy, doesn’t make you feel so full and heavy and yet you feel satisfied. The kodo millet pongal I have made is approximately 315 calories per serving. The count would come down if you don’t add coconut and cashew nuts. You will find that its easier to stick to a diet when it includes all the food groups. I like to make the food tasty and interesting. Bland food like plain steamed veggies is not my kind of diet. So go on try out this healthy version of pongal and enjoy it for dinner or lunch. You may serve it with sambhar and chutney but to keep the calorie count low I decided to serve it with plain yogurt. Wash lentil and kodo millet together in water. Wash and drain out the water about 3-4 times. Add the measured water and let it soak for 15-20 minutes. Add the mixture with the water into a pressure cooker. Add turmeric powder, salt, coconut, ginger and chili pastes. Close the lid of the pressure cooker, put it on medium heat. Let the pongal cook for 2 whistles. Turn off the heat. When the pressure from the cooker becomes less open the lid. Heat oil or ghee in a small pan over low heat. When it becomes hot add peppercorns, cumin seeds, cashew nuts and curry leaves. Stir the mixture for 30 seconds. Add asafetida. Mix well. Pour the tempering to the pongal. To make it a healthy meal we enjoyed it with plain yogurt. Add more or less water according to the consistency of the pongal you like. Adjust the ratio of millet to moong dal according to your preference. Add the flavors and spices to make it tasty. For vegan option don’t use ghee and serve with vegan yogurt or sambhar. lovely read, Mayuri ! we too r subbing Rice with millets wherever posisble and this pongal is one of the things we started with.. I loved your plating and the calorie info too..
Pongal with Millets is even more filling and we prefer this or Samba Wheat Dalia at home mostly over the traditional rice version. A side of chutney or sambar provides a much needed fuel to the body to run the whole day. Apt for Diabetics since they have to load up on good carbs. Yes it definitely is a good option for diabetics. For a Gujju to have a khichdi with sambar is a bit weird so hubby opted for yogurt. Thanks Priya, we loved it too. Simple and so full of flavours. Loved this healthy millet pongal.I want some sambhar too with it!!. I too don’t like blend veggies, simple wholesome meal with healthy ingredients is the key to good health for me too!! Thanks Swaty, bland veggies is something I don’t like, so always look for new ways to add veggies to grains and enjoy it. Thanks Sujata, it is a super healthy meal. 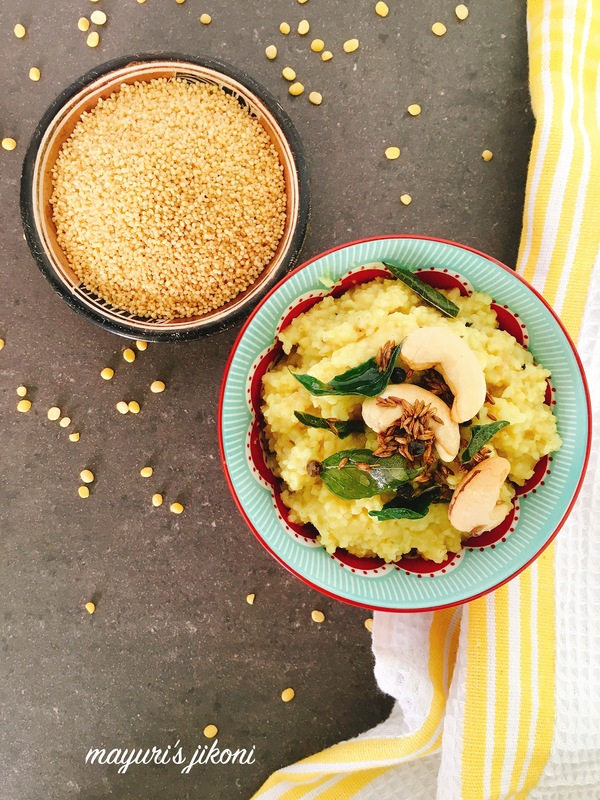 This millet and mung dal Pongal sounds a perfect breakfast option . Love your flavorful tempering di ! Thank you so much Poonam, we love it as a light meal. Personally I love millet pongal and cook millets every alternate day in some form I love this version of kodo millet pongal as I have often done only fox tail millet. Thanks Seema, I picked up kodo millet in Bangalore during my last visit and love using it. I also use foxtail millet. I love Ven Pongal with nice pepper tadka. Millet is a healthy substitute for Rice. I have tried with Quinoa. I am sure Millet Pongal tastes delish. Love this healthy recipe.Fab share. Thanks Preethi, I like the idea of using quinoa. Lovely post, Mayuri! How do you manage to make a simple pongal look so good? And the post is very timely. I have been using different grains in my diet, and the millet pongal will be a welcome addition. Thank you so much Sujata for the kind words. Thanks Veena, we loved the millet pongal. I love pongal in all forms -its an absolute comfort food for me .At home, even we have been making substitutes for rice and even wheat with other nutrition based millets and grains. I love the texture of this pongal, Mayuri and especally the tempering on top! This sounds like a tasty meal and healthy too.I have never cooked with this grain but will definitely check it out and purchase some next time I go to Asian market. Thanks Nayna, South India in that respect is so big on using different kinds of healthy millets. That’s how I got introduced to them. The only one before that I used was bajri and sorghum. I too make my pongal dishes with various millet to provide more nourishment for the body. Such a flavourful dish. Most welcome Ashima, it tastes really good, so do give it a try. This sounds and looks so much tasty. I have never used Kodo Millet and have a lot to learn. Thanks Mina, its called Kodo in South India but its known as kodri in our part of the world. It is such a great idea to start making changes little by little! So true Heidi as drastic changes don’t become habits. Ooooo, my favorite, pongal! I love the millet version more than the rice one! Fabulous share dear! Thank you so much Vanitha.